Yeshiva, part of a larger network of Jewish study halls, to extend Hesder track from 5 years to 6. 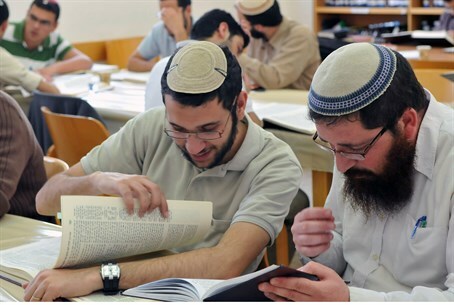 Defense Minister Moshe Yaalon has approved the establishment of another hesder yeshiva (Jewish study hall) in Kiryat Ono - one with a six-year program. Dubbed a "shesder" institution (a play on the Hebrew word for six, , the yeshiva will become one of a growing network of study halls which take the traditional hesder yeshiva system - one which combines 16 months of IDF service and 3.5 years of Jewish studies - and extend it to include both a longer IDF service and a longer term in the study hall. Rabbi Eliezer Sheinvald, who is opening this yeshiva as well as another like it approved 3 months ago for the city of Ofakim, opened the first yeshiva of its kind 9 years ago in the central Israel town of Modi'in. Rabbi Sheinvald, a retired colonel, stated that the move signals "a vote of confidence from the Ministry of Defense in the network we have established - a high-quality system allowing more yeshiva students to serve longer in both the IDF and their study hall." Sheinvald noted that "this is already the 9th year since we began" establishing yeshivas along these lines - and that it "has been a great blessing." He cites the fact that the yeshivas have not only allowed for students to complete the process of Rabbinical ordination, but also to become high-ranking officers. Regarding whether or not the new system could damage the existing hesder system, Shenvald maintained that there is a need for both systems within the national-religious community. 'We are not against the existing hesder framework," the 5 year program, "and we believe that there is a need for it. But a very large portion of the population also needs a longer, more intensive track for IDF service and Torah study." Sheinvald concluded, "We do not see why someone should be prevented from choosing either option."